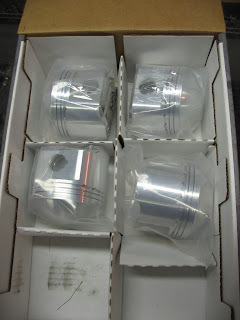 In order to raise the compression ratio without having another set of custom pistons made, I welded the domes to fill in unneeded valve pocket clearance. Despite the welding and re-machining, the piston dome thickness remained at a reasonable .200". The engine was not run too lean, in fact just the opposite. 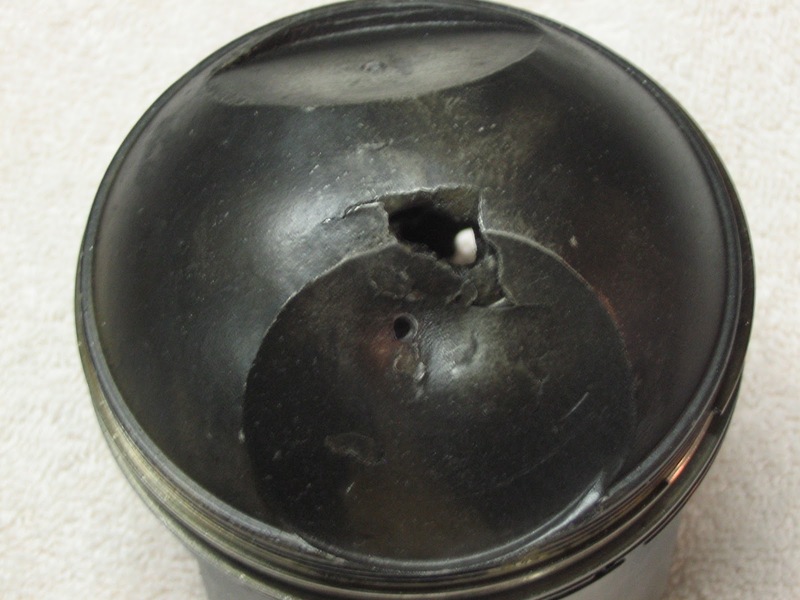 Rear cylinder piston failure is common on Harleys with dual fire (aka wasted spark) ignitions at Bonneville. Exhaust pocket had also begun to "sag"
To clarify, for those not up to date on Harleys old wasted spark ignition system, it works like this. On all but the latest offerings from Milwaukee, the timer, whether it be a battery/points ignition or a magneto, turns at half the speed of the engine. This timer has two lobes (or notches for later electronic ignitions) which open the points, initiating the spark. One lobe is set to open the points at the correct time for the front cylinder and the other at the correct time for the rear cylinder. In the case of the Goose, that time was at 42 degrees BTDC (before top dead center) on the compression stroke.But since these lobes both open the same single set of points, each cylinder gets a spark from each lobe, once at 42 BTDC on the compression stroke, and once on the exhaust stroke. Now you need to remember that the two cylinders on a Harley form a 45 degrees angle (thus the term 45 degree V-Twin). That means that at any given point in time, the front piston will be at a point 45 degrees behind the rear piston in crankshaft rotation (I know that sounds backwards, but its not). For instance, when the rear piston is at TDC on the compression stroke, the front piston will be 45 degrees away from reaching TDC, but it will be on the exhaust stroke. This 45 degree offset is what makes things interesting. 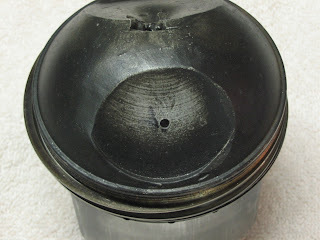 Obviously if the rear piston is the one that normally takes the hit at Bonneville, there must be something that differs front cylinder to rear which is the culprit. And if it seems to be exclusive to wasted spark ignitions, then that would be a good place to look. First lets look at the front cylinder. After plotting the SS Cycle KN420 camshaft that the Goose employs, we find this: At 42 degrees BTDC on the compression stroke the rear cylinder spark plug fires, and the wasted spark is produced at that same instant in the front cylinder. However, the front cylinder is not at 42 BTDC on the exhaust stroke, but rather 87 degrees BTDC (remember it trails the rear by 45 degrees). At this point in time the front intake valve is still on its seat, in fact still about 6 degrees before it comes to the opening ramp on the cam. The exhaust valve is just starting to close, but still near full lift. OK - no problem. That spark in the front cylinder with the exhaust valve open and intake valve closed won't do much. Now for the rear cylinder. When the front cylinder spark plug fires at 42 BTDC on the compression stroke, the rear cylinder is in a much different position. 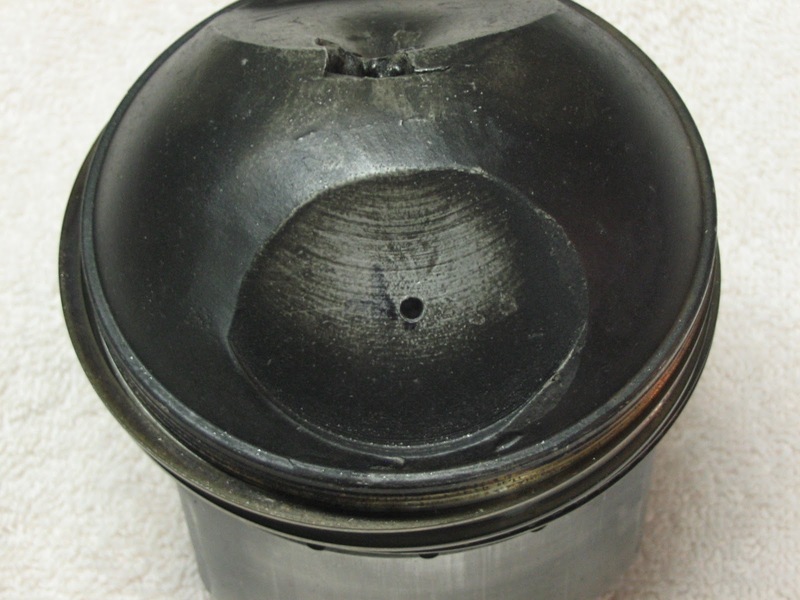 Because of the the 45 degree offset, the rear piston is at 3 ATDC (after top dead center); technically not even still on the exhaust stroke, but rather beginning its descent on the intake stroke. The exhaust valve is closing, but still .135" off its seat. The intake valve on the other hand has already started to open to the tune of .185" off its seat. Valve overlap is the common term. Now that gives one something to think about doesn't it? So her is some other pertinent info gleaned from PipeMax that may shed some light on the issue at hand. Assume the Goose's engine were running 5500 RPM. At the point where the rear cylinder receives its "wasted spark" (3 degrees ATDC in overlap), the piston has already started down on the intake stroke, accelerating to 325.5 feet per minute providing a "piston demand" of 10.1 cubic feet per minute of intake air flow. Raise the RPM to the target 7500 and that becomes a piston speed of 443.8 feet per minute with a piston demand of 13.8 cfm. All that is at a mere 3 degrees after top dead center. If you put stock in David Vizard's theories (and I do), you may recall that he puts a large amount of emphasis on the overlap portion of the cam timing. One of his conclusions is that the low pressure area caused by exhaust outflow results in the single strongest action initiating intake flow during this overlap period (hopefully I have paraphrased him properly). So what effect does it have when you throw a spark into the middle of that overlap period? A spark which incidentally does NOT occur during overlap on the front cylinder. Hmmm. So here are a few thoughts. Obviously the rear cylinder is subjected to a spark during overlap which the front cylinder does not. Since that cylinder is in overlap, there will be a fuel air mixture present to burn. Now, that fuel air mixture is not compressed, but certainly it can burn none the less. And what naturally comes along with burning fuel and air? That's right - heat; heat that the front cylinder is not subjected to. I have no way of knowing or even estimating how much extra heat the rear cylinder gets this way, but the evidence would suggest that it may be just enough extra heat to melt a piston dome. Here is something else to consider though. What happens when that wasted spark fires off and the fuel air mixture is richer than ideal? The BTUs are in the fuel, not the air, so I would assume that you would be releasing even more heat than with a correct mixture. Hmmm. Remember that I said that the Goose was not run too lean. It actually had the baseline jetting that it was dyno'ed with here in Minnesota. The reason I was pretty sure that the piston did not fail from a lean condition was that I believe that it was "pig rich" (as I like to call it). Could this be a case of a rich mixture giving the opposite results that one would expect? But why does this happen at Bonneville, but not on the drag strip or on the street? Well, my guess would be that it has everything to do with length of time spent under a heavy load. Remember that aerodynamic drag becomes a huge factor at high speeds. There are plenty of horsepower/MPH calculators available on line. Plugging in some estimates (guess-timates?) for weight, frontal area and drag coefficient, we find that if it takes a mere 29 HP to hit 100 MPH, the same bike would need 55 HP to get to 125, and 77 horses to reach 140. And if that is not enough of a wake up call, if you want to raise the MPH from 140 to 150 you better be ready to call up an extra 17 HP to wring out that 10 MPH. Bottom line is that high speed puts a tremendous load on a motor, and the longer that load is present, the better the chance for heat build up. Now we know that a drag motor will not see much time under full load and even less time at high speeds. If you hit 100 MPH in the 1/8 mile, then you will likely see the 1/4 mile finish line in another 4 seconds. And on the street? Despite thousands of bar room stories to the contrary, most street motors will never get more than a few seconds at full throttle and high speed before law enforcement rains on that parade. So where do we go from here? Obviously a single fire ignition system is in order. The exact form that will take is still up in the air, with part of the team leaning toward keeping things as simple as possible, and part leaning toward as hi-tech as possible. 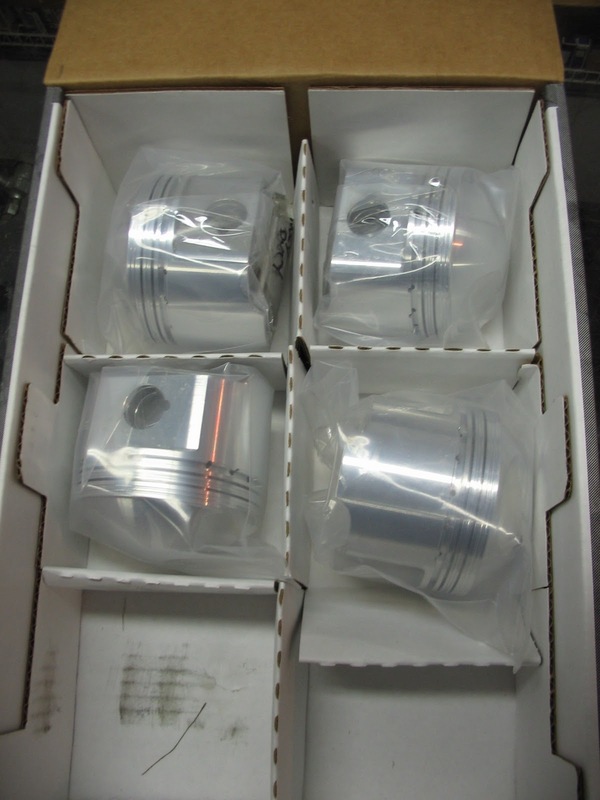 The other obvious bit is that new pistons are needed (you didn't really think I would weld them back up, did you?). That part has been settled. 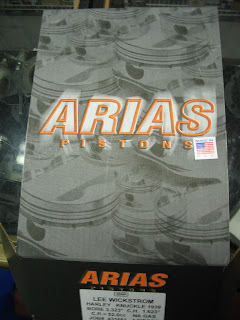 Four new pistons from Arias arrived this week, with the domes finished as per my sample (the undamaged front piston). They are down right beautiful, and hopefully the two spares will remain in the box as spares for a long, long time.